Lawrence University will serve as an eight-week host of a traveling exhibition that examines how President Abraham Lincoln used the U.S. Constitution to confront three intertwined crises of the Civil War: the secession of Southern states, slavery and wartime civil liberties. The 1,000-square-foot exhibit, “Lincoln: The Constitution and the Civil War,” will be displayed on the second floor of Lawrence’s Seeley G. Mudd Library. The exhibition, which opens Dec. 14 and runs until Feb. 8, is free and open to the public. Lawrence is the first of four stops the exhibition will make in Wisconsin between now and the end of 2015. Lincoln is widely acknowledged as one of America’s greatest presidents, but his historical reputation is contested. Was he a calculating politician willing to accommodate slavery, or a principled leader justly celebrated as the Great Emancipator? The exhibition encourages visitors to form a nuanced view of Lincoln by engaging them with his struggle to reconcile his policy preferences with basic American ideals of liberty and equality. 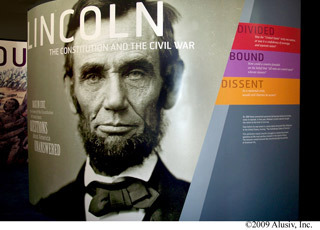 The exhibition develops a more complete understanding of Lincoln as president and the Civil War as the nation’s gravest constitutional crisis. 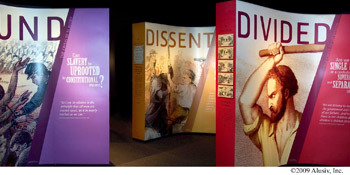 Each section of the exhibit highlights different aspects of Lincoln’s presidency, such as slavery, which examines the various policy options Lincoln once embraced and how his thoughts about slavery evolved over time. The exhibition is composed of informative panels featuring photographic reproductions of original documents, including a draft of Lincoln’s first inaugural speech, the Emancipation Proclamation and the Thirteenth Amendment. Elected president in 1860 when the nation was on the brink of civil war, Lincoln struggled to resolve the basic questions that divided Americans at the most perilous moment in the country’s history: Was the United States truly one nation, or was it a confederacy of sovereign and separate states? How could a country founded on the belief that “all men are created equal” tolerate slavery? In a national crisis, would civil liberties be secure? As president, Lincoln used the Constitution to confront these three crises of war, ultimately reinventing the Constitution and the promise of American life. • 1981 Lawrence graduate James Cornelius, curator of the Lincoln Collection in the Abraham Lincoln Presidential Library and Museum in Springfield, Ill.
• Jerald Podair, professor of history and Robert S. French Professor of American Studies at Lawrence. • Arnold Shober, associate professor of government at Lawrence.